What is CompTIA CASP+ and Why is it so Important? 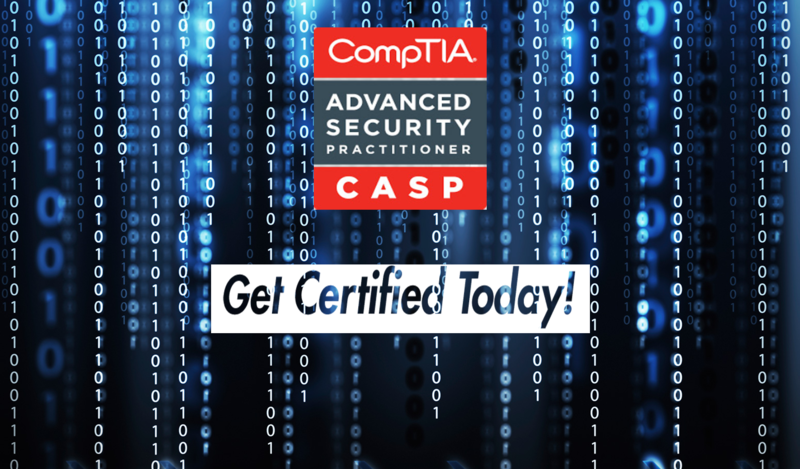 CompTIA’s CASP+ or CompTIA advanced security practitioner is the perfect certification for any cybersecurity professional. The CASP+ course goes over everything that cybersecurity is about with key topics such as implementing policies and framework, risk management, security operations, and the integration of enterprise security. CASP+ is an advanced level course that provides candidates with the right amount of knowledge to lead a team of cybersecurity experts and land advanced management level jobs within the cybersecurity industry. The CASP+ certification is obtained after a difficult exam that consists of 90 questions and you are allotted 165 minutes to complete the exam; however, do not be discouraged because there are many easy ways to pass this exam. Why Should I take CASP+? CASP+ is intended for cybersecurity professionals who have a minimum of two years of work experience in the cybersecurity industry, but the CASP+ exam has no required pre-requisites so anyone can take the exam. This certification shows employers that you have tons of knowledge regarding everything that is cybersecurity. All successful candidates will be able to show complete competency in enterprise security, risk management, design and implementation of strategies, and different business disciplines. Those who successfully complete CASP+ and, earn the certification, report an average annual salary of $84,000 and work in jobs such as system engineers, information security analysts, and cybersecurity engineers. Overall, the CASP+ exam shows employers that you have initiative and determination to take up new challenges and it also shows employers that you are proficient in all thing’s cybersecurity. How can I get the CASP+ Certification? The CASP+ certification is not easily earned, but it is not impossible either. The exam code that CASP+ is using currently is CAS-003 and the exam contains simulation questions and multiple-choice questions. Self-study for CASP+ exam can be very difficult and become very frustrating, so the best way to guarantee a passing score is to go with instructor-led training. Instructor-led training is amazing because it allows students to interact and build better communication skills, listen to live lectures and ask questions and take practice exams to ensure you are ready for the real exam when the time comes. Since this is CompTIA’s highest-level course and exam there are no scores and the CAS-003 exam is graded on a pass/fail basis, and that is exactly why we recommend instructor-led training to ensure that you pass the CASP+ exam on the first try. What’s Next after I receive my Certification? After receiving the CASP+ certification you will be excited and joyful that all your hard work was well worth it, and the CASP+ certification will open new windows and opportunities in the IT industry and show employers that you have drive and initiative as an employee. This certification is also useful for anyone who is currently working in the cybersecurity industry because it allows candidates to move up to management level positions. With higher positions come more job responsibility and higher pay, but it also opens new windows for higher education. After earning the CASP+ exam candidates usually, pursue further education by earning other high-end advanced certifications such as CISSP and CCISO. The CASP+ exam is beneficial to both individuals and organizations and the best time to get started is today by enrolling in the course with SecureNinja! Ready to enroll in CASP+? Call 703-535-8600 today to qualify for special promotions and get enrolled in less than 5 minutes!